Volatility is, literally, the up-and-down movement of the market caused by investor sentiments that drive trading activity. Technically, volatility is measured by the standard deviation from expectations, or “normal” market movement. “Normal” is about 5.8% a month and 20% a year. That’s not much change, especially on a daily basis, and we get happily used to those nice, tiny fluctuations. But just like when we’re riding on a real rollercoaster, those little bumps aren’t so bad—it’s the monstrous drops that make our stomachs turn over! As we’ve seen recently, volatility causes downward stock price pressure as anxious sellers drive down market prices. The current sell-off is being driven by amorphous fears about a slowdown in global growth. In the early 2000s, the cause was poor earnings and devaluations of tech companies. Then came the turmoil of 9/11. In 2008, it was the financial crisis. More recently, Greece and China have been the culprits. Each of these events brought uncertainty, which spurred volatility, which created fear. Of course, fear then impacts the market, which creates a vicious chicken-and-egg situation. The bank rush of the 1930s is a great example. Some banks collapsed, and the fear of more failures caused a run on the banks. Were all banks in trouble? No. But people who had their money in the institutions that did fail lost all their savings (deposit insurance didn’t exist at the time), and that fact caused widespread panic. Clearly fear—especially when it comes to money—can be much more contagious than any plague. The good news is that uncertainty eventually passes. Each crisis, whatever it may be, resolves itself one way or the other. Fear dissipates. And volatility levels return to normal. For investors, the most important thing to remember is that market volatility is temporary while the overall movement of the market is long-term. Dan (an acquaintance, not a client!) was one of many who let fear drive his decisions back in 2008. He pulled everything out of the stock market to “cut his losses.” His plan, of course, was to put his money back in as soon as things returned to normal. But Dan’s strategy had a major flaw. Now, at the end of a seven-year bull market, Dan asked me if it’s safe to get “back into the market?” My answer, of course, is that investing requires discipline and education. And that if he thinks he has the skill to “speculate” on price fluctuations, well…he’ll likely end up on the wrong side of every trade. If Dan would only take the time to understand investing and the story of the escalator and the yo-yo, then he’d be ready to be a wise investor. Picture it: you’re on an up escalator playing with a yo-yo. The yo-yo is going up and down on a small scale, while the escalator is going one way—up—on a large scale. Yes, the yo-yo continues to move, but it (and you) continue to move in one direction: up! 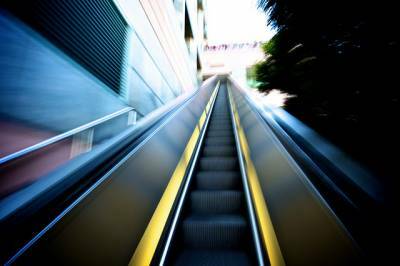 Now imagine the yoyo is market volatility, and the escalator is the market itself. Even if you’re a really bad yoyo-er (like me) and the yo-yo falls all the way to the end of its string before you wrap it back up again, you’re still continuing to move in the right direction. Martin Brower is considered by many to be a real estate expert in Orange County. A former Irvine Company exec, he currently writes the column Along the Coast in Orange County’s Coast Magazine. As an expert, he’s often asked, “where is the real estate market headed?” I’ve heard Martin answer, “I don’t know where it’s going, but let me tell you where it’s been.” He then tells his own story of the Westchester home he purchased in the 1950s—what he paid then and today’s price. He didn’t talk about yo-yos, or the collapse in 2008, but he did point out that the trend is clearly up and the change is exponential. Over time. The lesson learned is this: As an asset class, real estate is good, but it’s no greater than any other asset class. The perceived over-performance is the result of the typically very long hold period associated with home ownership. Holding on to your investments—whatever they may be—is the key to long-term success. So yes, the yo-yo has been going up and down for weeks now. And just as it started to settle down, the Fed opted not to raise interest rates. So we’re back in yoyo territory. But just remember that the escalator is still going up. Maybe not as quickly as we’d all like, but that movement, over the long term, will eventually get us where we plan to go. 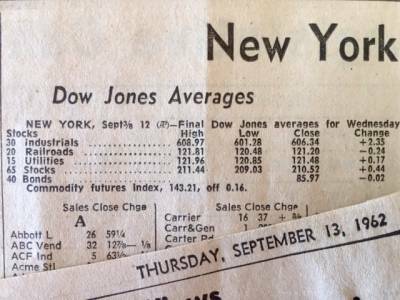 And if you need a small daily reminder to keep you smiling, just print out a copy of this old newspaper I came across the other day and imagine what a fortune those who invested in 1962 have today—as long as they stayed put and ignored the yo-yo. I hope you’re one of them! Still wondering how the yo-yo will affect your long-term outlook? Email me to schedule a time to chat. As always, I’m here to help.